ETHAN M. HUNT is in action again. An attack from mysterious rival, trapped in a glass box, looking at his fellow agent Lauren shot to death, then smoke make him unconscious. Even worse CIA Director Alan Hunley wants to shut down IMF (Impossible Mission Force) and hunts Ethan down. IMF Boss, Brandt, could not help him. Giving Ethan no choice but to hunt down his enemy, Solomon Lane, on his own. Lane is Ethan's equal except he is the bad guy. In the middle comes an unpredictable lady, Ilsa Faust. Brandt with his two remaining agents; Benji and Luther, tracks Ethan all over the world, until they arrive in London in the middle of a conflict between M16 Leader and British Prime Minister. Ethan and friends set a trap for Lane. Nothing is Impossible if you know how it works. The first film (1996) was directed by Brian De Palma with a budget of USD 80 millions and total earning of USD 458 millions from worldwide distribution. The second (2000) was directed by John Woo with a USD 125 million budget and total income of USD 546 million. The third (2006) by JJ Abrams, with a budget of USD 150 million and total earning of only USD 398 million. 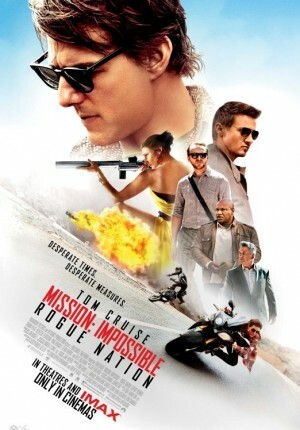 But in Ghost Protocol (2011) by director Brad Bird, the earnings raised to USD 695 million with a budget of USD 145 million. Now the fifth which cost USD 150 million is believed to break the highest record. Director Christopher McQuarrie has been working together with Cruise for many times including directing and writing the script for Jack Reacher (2012). The female star is played by Rebecca Ferguson, a Swedish actress. Jermy Renner as IMF Leader. The funny Simon Pegg and the black Ving Rhames play as Ethan's partner. Their big enemy is played by Sean Harris. Alec Baldwin becomes the CIA director, meets British PM played by Tom Hollander.